The Texas Cryptid Hunter site has been named one of the top 40 paranormal blogs of 2010 by Online Schools. This award highlights the very best blogs to learn about the Paranormal and all things related on the internet that were nominated by the internet community, and is designed to thank the authors for their contribution toward the world wide web we all use & enjoy. This allows us to generate a candidate list that is based upon what the internet determines as being good, original content. We stay away from a voting system because the only information that gives us is how well a site's readership can click a button. After a list of candidates is compiled, we then filter the list to ensure that each site qualifies for the category. We then give the list to be scored by our panel of 5 judges. Each judge rates each blog across 20 different attributes, including content, frequency of updates, amount of advertising, length of posts, and readibility. This then provides the site with a ‘subjective’ score. These ratings are combined into an aggregate total for the 5 judges. The amount of nominations are also converted into a score, and this score combined with the aggregate score gives the blog its final rating. The ratings are then compared for each site within a category and awards are given out to blogs in the 99% percentile (meaning the top 1% of blogs receive awards). I've never really considered my site to be a paranormal blog per se so I was surprised my site was honored with this award. I was even more humbled to learn that readers nominated the site. So thank you to Online Schools and to the reader or readers that nominated the Texas Cryptid Hunter site. I very much appreciate it. 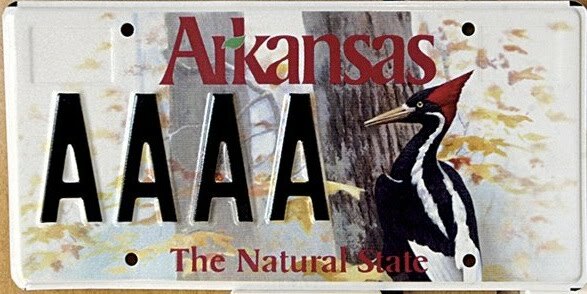 I think this is about as cool as a a license plate can get. If I lived in Arkansas I would have this plate on my truck. A woman in Jack County, Texas was bitten by what the local news media have dubbed a 'Chupacabra.' The woman was bitten on the hand after offering the animal a bowl of water. According to the report the woman is now undergoing treatment for rabies. View the news report here. Jack County is located in North Central Texas and is sparsely populated. According to the U.S. Census Bureau there are only 10 people, on average, per square mile in the county. Jack County's wide open spaces support a lot of wildlife including large predators like cougars and coyotes. Occasionally, rarer species show up. For example, an ocelot was found dead on the side of one of the county's roads last year. 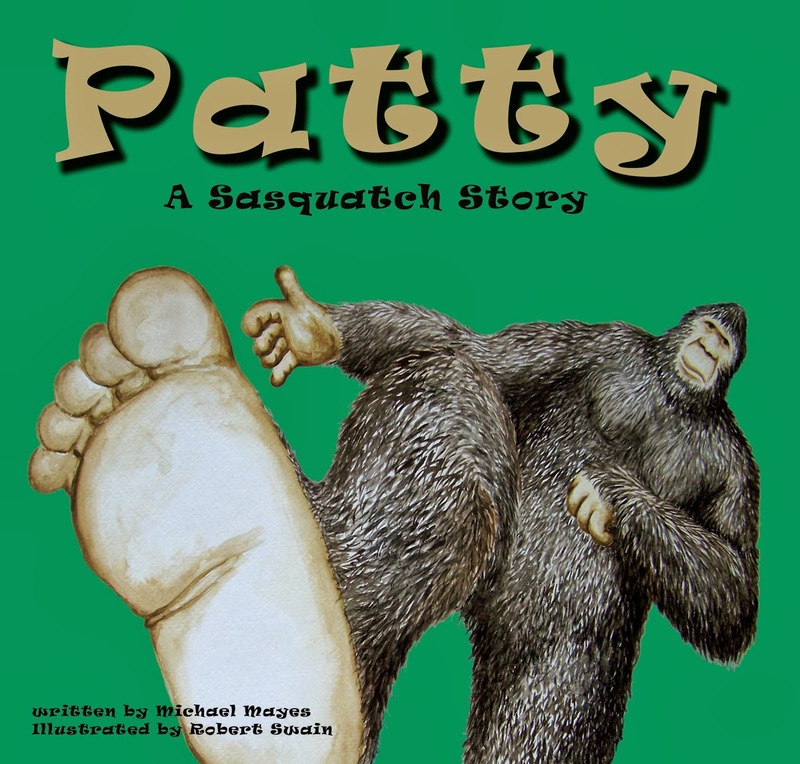 There have even been a couple of alleged sasquatch encounters there. Now, it seems, we can add the 'chupacabra' to the list. The animal was shot and killed in the aftermath of the attack. 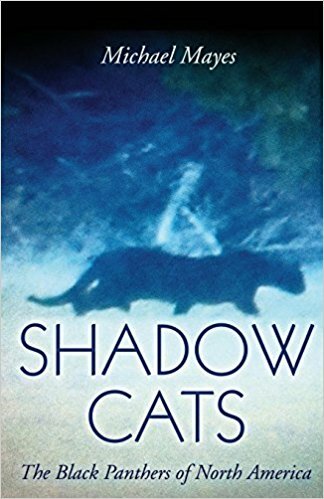 It fits the description of the 'blue dogs', hairless canines of some sort about the size of coyotes, that are now being seen all over the Lone Star State. The timing of this story is ironic as I posted just today about a sighting of one of these 'blue dogs' or 'chupacabras' here in Central Texas. The animal was obviously in very poor health and the body was, according to the report, sent to a lab for testing. The woman who was bitten noted the animal's poor appearance and cites it as the reason she offered it water. The creature is gaunt and covered in scabs. The only hair on the body seems to be a wispy strip on top of the head and down the shoulders and back. 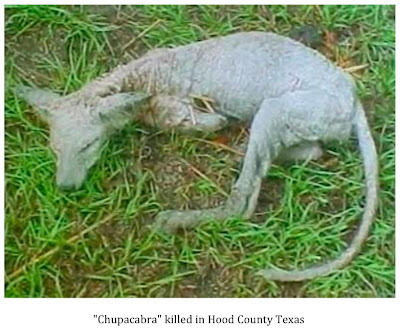 I have for years thought that these 'chupacabras' were nothing more than coyotes afflicted with severe cases of mange. While I believe that theory does explain a lot of these cases, I am beginning to wonder if it fits across the board. 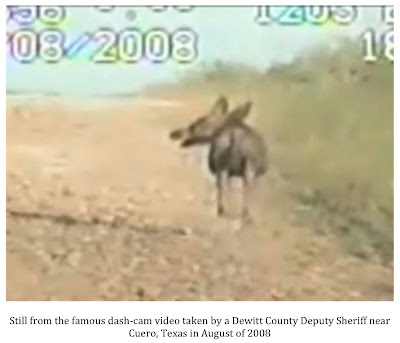 As I was preparing the post about the 'Chupacabra' sighting in Central Texas I revisited the footage of one of these animals running down a road outside of Cuero, Texas in DeWitt County. The footage, shot from a Deputy Sheriff's dashboard camera shows a very strange looking animal. The head is very big and the snout does not look coyote-lik at all. The animal is sporting a pair of ears that look like they would be more at home on a mule than a canine. Most of the 'blue dogs' or 'chupacabras' that have been killed have smaller heads and ears much more in proportion to their overall size. The animal that bit this lady fits into that category leading me to believe it was a sickly, mangy, dog of some sort. Occasionally, one of these animals exhibiting characteristics more like those seen in the DeWitt County footage surfaces. These are the animals whose DNA I would like to see tested. Whether these animals are an as yet undocumented species, mutated coyotes, or varied species suffering from what seems to be a sarcoptic mange epidemic remains to be seen. Whatever they are some interesting questions should be addressed. If they are a new species where did they come from? Why are they showing up now? If they are some sort of mutated coyotes what caused the mutation? Why are they hairless? Why are they popping up all over the state? If they are actually several different common species, all suffering from mange, what can be done to stop the spread of the disease? Why is it spreading so quickly? Why now? All interesting questions to ponder no matter what the 'blue dogs' or 'chupacabras' of Texas turn out to be. *CORRECTION: The ocelot found road killed last year was actually found in Palo Pinto County, not far from Jack County. I apologize for the error. I received the following email from a reader two days ago. My name is XXXX, I live in Kempner,Tx. A few weeks ago I saw a critter of some kind on my property, at first I thought is was a deer but it had a long tail, maybe a fox, no a fox has a bushy tail. I did not have a camera handy but I had my cell phone so I took a picture with it. The phone does not have a zoom lens so the picture is not very good but I got a good look at this thing. 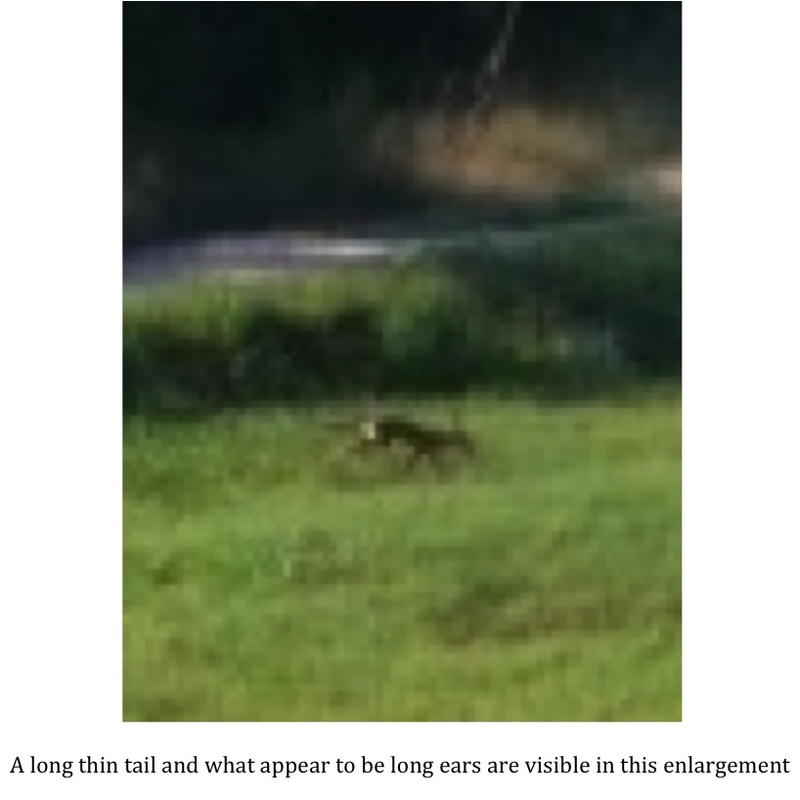 It looked like a dog but had large ears and a very long thin tail. After seeing pictures of "Chupra Cabras" on TV and the internet that were killed recently I am almost certain what I saw was the same thing. I am attaching the picture I took in case you have some method of enhancing it and perhaps let me know what you think it is. The reader sent the following two photos. A relatively small animal of some kind is visible in the photos. 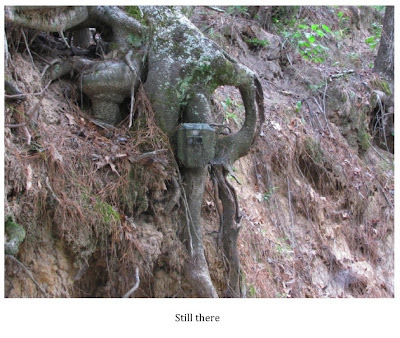 As the reader mentioned, the photos were taken with a cell phone that did not have the ability to zoom in on the creature. It is hard to tell much about the animal in the photos other than it appears to be about the size of a medium sized dog. 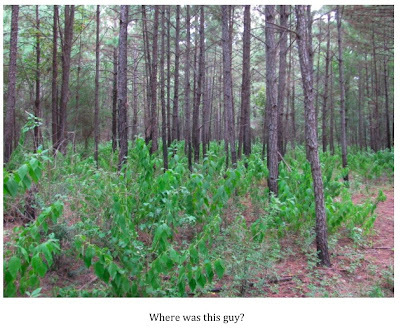 I can't be sure about this as I am unfamiliar with the property and don't have much to use for scale; however, the animal seems to match up well with the description the reader gave in his email. I attempted to enlarge the photo with mixed results. As would be expected, the more I zoomed in the more pixellated and blurry the image became. What you can see is interesting, however. The animal exhibits what appear to be a pair of pretty large ears and a long whip-like tail. 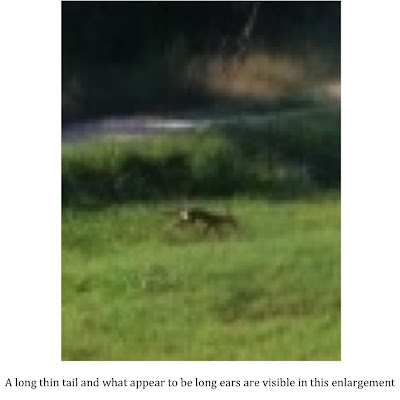 It is hard to tell if the animal is, indeed, hairless but the tail does not seem at all "bushy" as one would expect to see on a coyote or a fox. The profile seems to match up favorably with what has been seen in the "blue dogs" of south Texas. 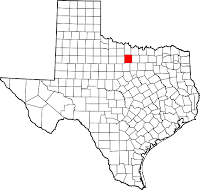 Kempner, Texas is located in Coryell County and is not really all that far removed from areas where these animals have been spotted on a fairly regular basis. The owner of the property is going to keep his eyes open. If he catches another glimpse of the animal he is going to let me know. 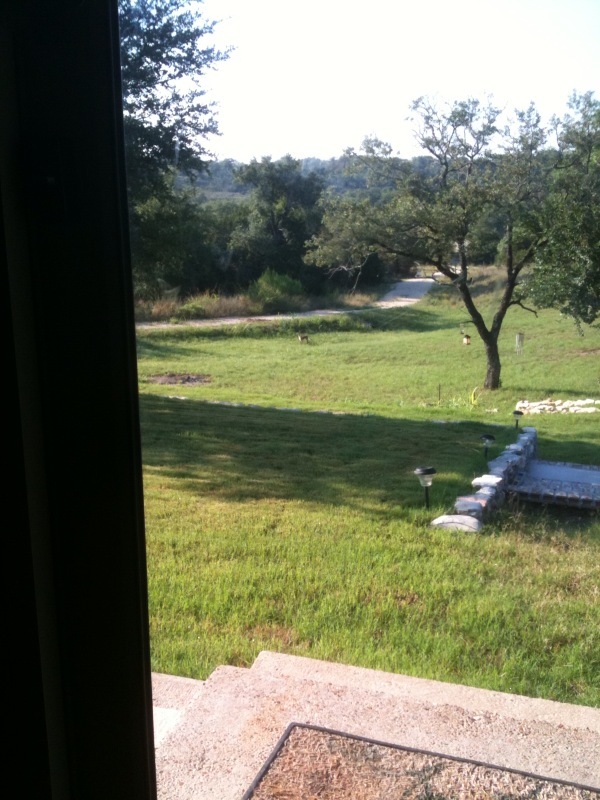 He said he is open to my placing a couple of game cameras on his property. 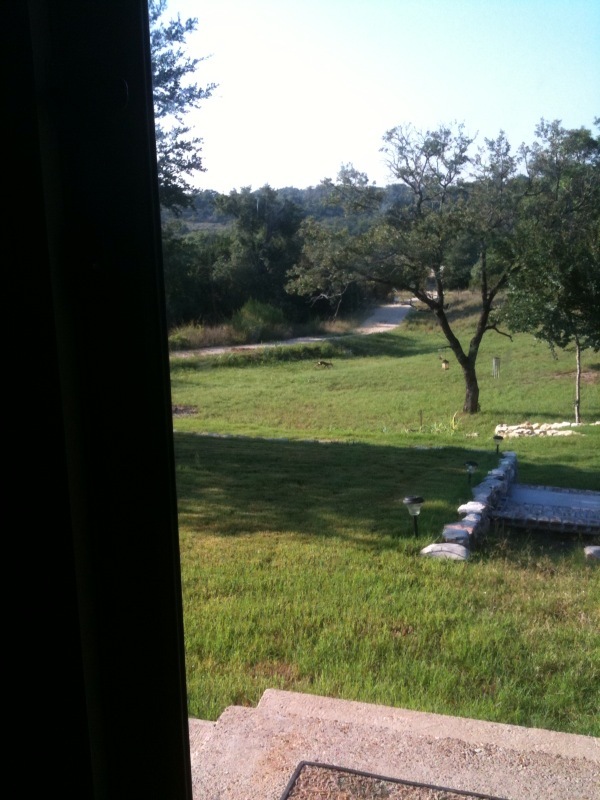 Is the elusive "chupacabra" haunting Central Texas? I am hoping time will tell. 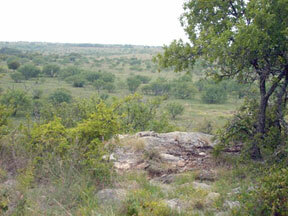 I have posted some of my favorite photos of wildlife over at the Texas Cryptid Hunter Facebook page. Some of the photos have been previously posted here but others have not. 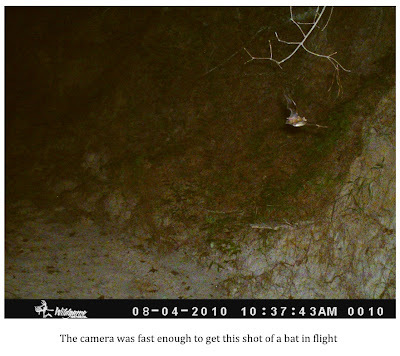 Some of the photos I took myself and some were taken using my game cameras. There is a pretty good variety of varmints to check out. To view the photos just hit the big blue Facebook button in the right margin. Once at the page just click on the "Assorted Wildlife Photos" album. I hope you enjoy checking them out. I made a quick trip to SE Texas last Saturday. 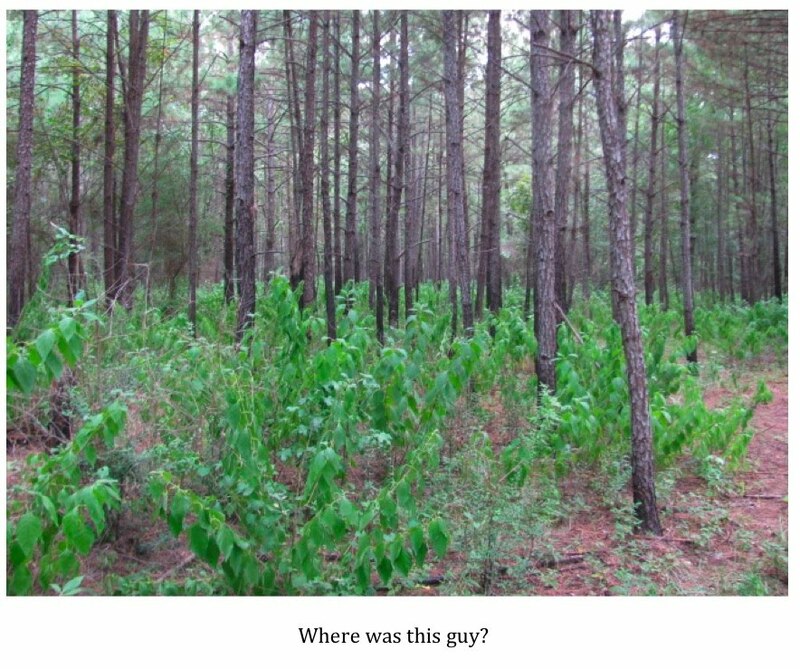 The purpose of the trip was to check on the game camera I had placed in the field last month. 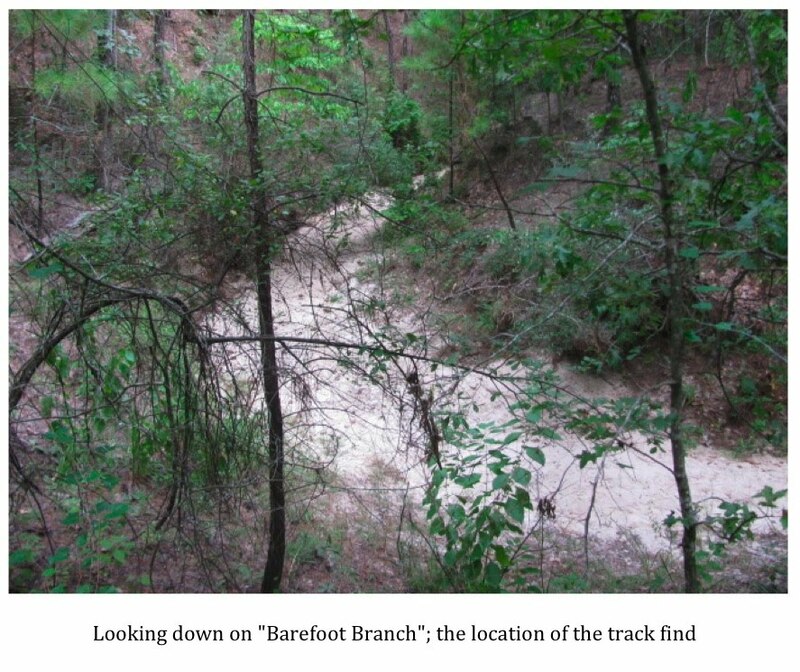 The camera was placed in the same creek bed where barefoot humanoid tracks were found last May. Various delays and distractions kept me from getting down to the area early enough to do much looking around. I arrived in the area at about 3:30pm and proceeded immediately to the camera location. The weather was beginning to look a bit threatening and I didn't relish the thought of being caught out in a thunderstorm. I was alone so I was able to double-time it and reached the camera location fairly quickly. I was relieved to find the camera right where I had left it. It seemed to have shifted slightly but, otherwise, was in perfect condition. 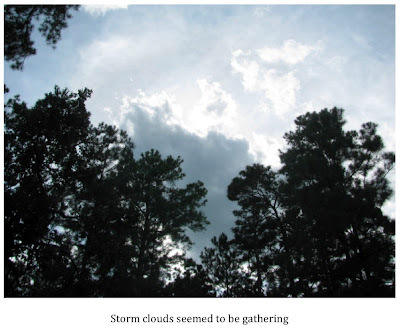 I was greatly excited by the possibility of what I might have captured on the memory card. I decided to pull the camera (to be replaced by a higher end model ASAP) and put it in my backpack. I was in a hurry to get back to my truck, where my laptop was locked up, so I could view the photos; however, since I had made such good time to the camera location, I decided to take some time and walk the creek in the hopes of finding something interesting. I failed to find much of interest and decided, prompted a bit by some not too distant thunder, to hoof it on out and get back to the truck. The heat, being August in Texas, was awful and the humidity was high. I had expended a lot of energy in hustling out to the site and in walking the creek. I began to feel the effects and needed to stop and sit down a couple of times. By this time, I was completely soaked with sweat and was on my way to developing a doozy of a headache. I had only taken a couple of bottles of water on the hike, as I didn't intend on being out very long, and they had been drained back in the creek. I have no doubt mild dehydration was causing my headache and fatigue. By now, it was approaching 5:30pm and it was as hot as it had been all day. The forest was absolutely still. There was not even the hint of a breeze. 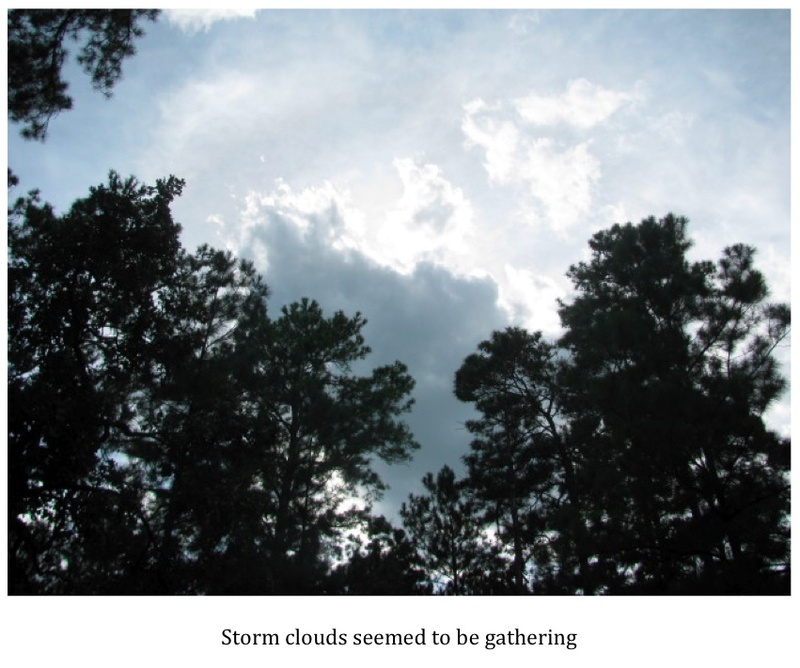 The threatening clouds had retreated to a point where I could no longer see them. The incoming storm had been nothing more than a tease. After resting for a while, I resumed my hike back to the truck. I was, according to my GPS unit, about .30 of a mile from my truck when a gunshot rang out from just East of my location. It sounded very close. I'm guessing the shooter was within 100 yards of me. I instantly dropped to a knee. I did not hear the whiz of a bullet flying through the air near me or hear a round strike any of the vegetation around me so I felt pretty confident that the shooter did not realize I was in the neighborhood. About then a second shot was fired. I was still on a knee but lowered my head even more upon hearing this shot. Again, there was no sound of a round hitting anything close to me but this guy was just too close for me to take a chance on standing up and continuing my hike. I decided I needed to let this guy know I was in the area. I shouted, "Hold your fire! Hold your fire!" Within two or three seconds two more shots rang out. Now to be fair, I can't say for sure the shooter heard me shouting at him before he squeezed off those last two rounds. I no longer felt nearly as confident, however, that the guy was just out varmint hunting or target shooting and was unaware of my presence. So, I unholstered my sidearm and fired two rounds of my own into the ground. I was not playing "cowboy" or trying to threaten anyone. I just really needed this guy to realize I was close by and that he needed to hold his fire. I also wanted him to know, in case he was playing games with me that I was far from helpless. I stayed hunkered down about ten minutes but heard no more shots. Cautiously, I stood up and resumed my hike back to the truck. I made it to my vehicle without incident. I sat down on my tailgate to rest and take in some more water (The temperature was still 101 degrees at this time). I changed into some dry clothes and loaded up my gear. All together I probably stayed at my truck at least another half hour before cranking it up and leaving. I never heard another shot. I guess my message had been received. The camera did not manage to capture much of anything. The coolest photo is of a bat in flight. I do think sometimes there can be significance it what was not photographed. No humans were photographed walking the creek. Not one hiker had come by in a month. Take from that what you will. The trip highlights some of the potential dangers of being out in the field. First, whenever possible, have a partner with you. I had notified fellow TBRC members that I was making the trip but was by myself. Second, always take more water out with you than you think you will need. I know this but still managed to convince myself that, even though it was terribly hot and humid, I would be in and out quickly and the extra weight of more water would do me more harm than good. Stupid. Third, do not go out unarmed. Understand that you can arm yourself with something other than a gun. A good knife is invaluable in survival situations of many kinds. I choose to carry a sidearm, I am licensed by the state of Texas to carry a concealed handgun, but always have a good knife with me as well. I don't know if the guy who was out in the woods firing his weapon actually intended any mischief towards me but I can tell you that I would have been extremely nervous had I been unarmed in that situation. Wild animals are often the least of your worries while out in the deep woods. I have posted some photos of my 2008 trip to Skamania County, Washington. 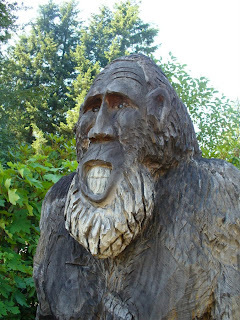 Skamania County has more sasquatch reports than any other county in the country. We camped in the Gifford-Pinchot National Forest near Skookum Meadow. 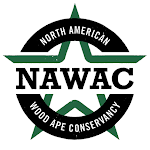 We visited the sight where the famous Skookum cast was made, Ape Cave, the scene of the "grass cutter" sighting, and several other sasquatch hot spots. We camped in a spot that had great views of both Mt. St. Helens and Mt. Adams. The area was one of the most beautiful places I've ever visited. I hope to make it back up there someday. To see some of the pictures from the trip visit the Texas Cryptid Hunter Facebook page. Just hit the big blue "Facebook" link in the right margin and visit the "Washington Trip" photo album. U.S. Rep. Chet Edwards, D-Waco, has filed legislation that would remove the gray wolf from federal threatened and endangered species lists in the United States. The protection of gray wolves via the Endangered Species Act has been controversial from the start. Ranchers in parts of the country where wolf populations have rebounded have long claimed that they were losing livestock to the packs. Delisting the species would allow states with healthy wolf populations to set up hunting seasons and management programs for the animals in hopes of stemming the livestock losses. Why Chet Edwards, a Rep. from Texas, would file this legislation is a bit puzzling to me. 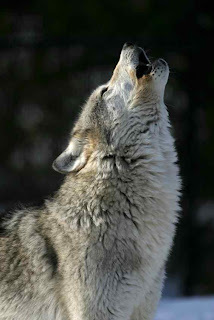 According to the Texas Parks & Wildlife, both the gray wolf and red wolf have long been absent from the Lone Star State. This being the case, it is odd to me that Edwards would be the one to put forward this bill. Edwards explained, "I am a hunter, and several fellow hunters have approached me about the gray wolf devastating livestock and elk in parts of the United States where many Texans hunt. The gray wolf population is once again healthy and abundant in many parts of the country, and we have an obligation to support our farmers and ranchers and help them to protect livestock from the threat of growing populations of gray wolf." Not surprisingly, environmental groups are vehemently against the bill. The Defenders of Wildlife and the Center for Biological Diversity have argued that the wolf population is far from being out of danger and this bill would push the species back into perilous territory. Bill Snape, senior counsel for the Center for Biological Diversity, said, "This is clearly a chest beating exercise, which is his right. It's called red-meat, macho politics." Snape doesn't feel the bill has much of a chance to pass, however, due to the facts it has been presented so late in the congressional session and several similar bills have failed in the past. I am still puzzled by what Rep. Edwards is hoping to accomplish by filing this legislation. He represents a state that has no wolf population (well, that is debatable but a topic for another time). It would seem he has no dog in this fight (no pun intended). On the surface, it doesn't seem like the sort of legislation a Democrat would want anything to do with. Edwards is a Democrat in an overwhelmingly Republican state and a consumate politician, however. Whatever his motivations, I'm sure they are well thought out. Is this just "chest beating," as Bill Snape said, to show his constituents, many of which are gun owners, hunters, and staunch 2nd Amendment advocates, that he is one of them? The move does seem to have minimal risk for Rep. Edwards. His stance could very well appeal to a large number of Texans who love to hunt. It also shows he is not "anti-gun" in a strongly pro-gun state. Meanwhile, the environmental groups that the legislation angers are based in other states and can't vote in Texas. The timing of the legislation is also a telling sign. Rep. Edwards knows full well that there is no time for the bill to be debated in house and, thus, has no shot at passing. So, in the end, the bill doesn't pass and Rep. Edwards gets some publicity. On the other hand, it is possible that this issue, for whatever reason, is near and dear to Rep. Edward's heart. If so, I could appreciate his sincerity regardless of whether or not I agree with his position. I don't pretend to know much about the wolf issue in our northern states. Maybe there is a real problem that needs managing. I'm just not convinced Rep. Edwards knows much more about the issue than I do. I would certainly feel better if he gave more reasons for writing the bill than just the fact that he had been approached by "several" hunters who were concerned about wolves killing livestock. 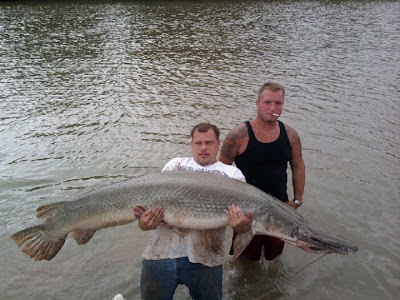 A real Texas "River Monster" was hauled out of the Brazos River by a gentleman named Kelly Thompson recently. I don't have any details on the measurements or weight of this fish but it is a hoss to be sure. This photo was emailed to me by a reader who spotted it on the Texas Parks & Wildlife Facebook page. You can see the post and then read about how the state is going about protecting our trophy gar fishery here. The 2010 Texas Bigfoot Conference is returning to Tyler on October 30th. I will provide some more details on speakers, events, etc. soon. If you would like to reserve your spot you can do so here. "All truth passes through three stages: First, it is ridiculed. Second, it is violently opposed. Third, it is accepted as self-evident." I think we are currently somewhere in between stages one and two when it comes to most people accepting the existence of cryptid animals like the sasquatch and the yeti. It is my hope that proof will be forthcoming and their existence will be "self-evident" sooner, rather than later.